It’s been quite long since I posted something. Main reason is we’re having a bit of a situation in Israel these days – some “unusual garbage” is falling on our heads, courtesy of our “cousins” from Gaza… But here I am, practically smoking under fire :)! 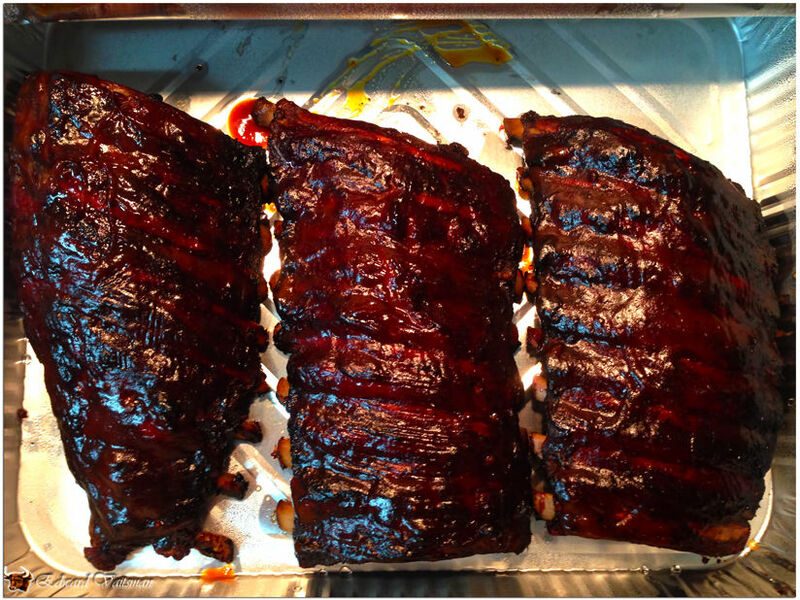 Last weekend I succeeded to lay my hands on those nice baby back ribs… Unfortunately, pork is not the most popular meat in Israel, and even where it is, baby backs are quite rare to find. But here I am, with 4 decent beautiful racks, which I was dying to get on my smoker. First thing’s first – remove the membrane. On the back side of the ribs there’s a membrane which prevents the smoke from penetrating the meat. Here’s a very nice youtube link about how to remove the membrane easily. Once you got the membrane off generous sprinkle with a spice rub, and off to the refrigerator for a night. On a next day, when ready to cook, preheat the smoker to around 230 F (that’s 110 C, give or take). I use a 22.5″ WSM (Weber Smokey Mountain), which is a vertical water smoker, so I got the water pan filled with water and threw in few sprigs of fresh rosemary. Wood – 2 big chunks of peach, one chunk of pecan. For the heat in the sauce, mix in that additional 1 tsp of chili powder, and you’re all set. Smoke time – about 4 hours, no wrapping. 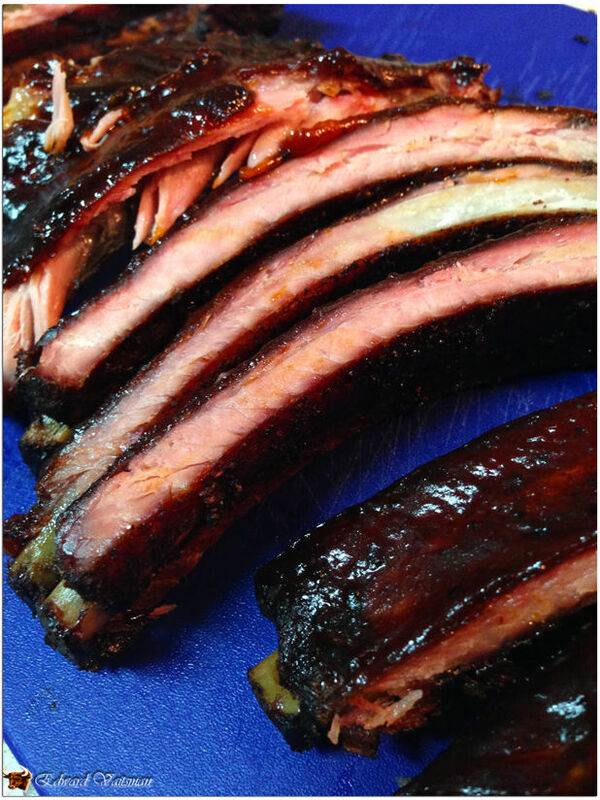 During the last hour – brush the ribs 2-3 times with the BBQ sauce. You’ll know when the ribs are done when you try to bend the rack and it breaks :). 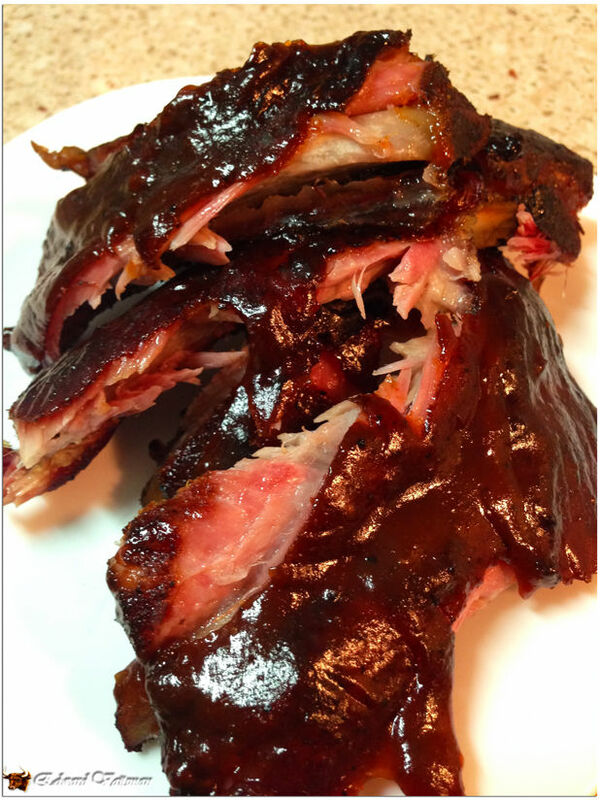 This entry was posted in Pork and tagged baby back ribs, baby backs, BBQ, low & slow, pork, ribs, rub, sauce, smoker, smoking, spices, Weber, WSM. ← Prosciutto wrapped baby grouper – grilling fish made easy!